The riots which occurred in August 2011 across Britain happened thirty years after the riots that swept the country in the spring and summer of 1981. In the discourses that emerged surrounding the 2011 events, many commentators made comparison between the contemporary disturbances and those that occurred in 1981. This article examines two arguments that emerged out of the comparison between the two events. Firstly, a consensus seemed to have been reached concerning the causes, motives and actions of the 1981 riots, particularly, that the 1981 events were a “legitimate” form of protest against police harassment and institutional racism. This was supposedly in contrast to the “criminality” of those involved in the 2011 events, with the suggestion that those who were rioting nowadays had no legitimate grievances to rebel against. Secondly, amongst those had sympathies with those in “rebellion”, a consensus was formed that the events of August 2011 were repetitions of those which occurred in 1981. For many on the left and within activist circles, the same neoliberal/monetarist agenda by the Tories (creating high unemployment and cuts to public services), combined with continuing institutional racism, were the underlying causes for the 2011 riots and those of the 1980s, and the lessons of the battles against Thatcherism were to be heeded. This article will show how the history of the riots of the 1980s were used by various commentators on the left and the right to interpret why the events of August 2011 happened and what the response to these events should have been. The article will propose that while historical comparisons are useful, the problem of these discourses of the 2011 riots was that they were primarily seen through a historical prism that depended on an interpretation of the history of Britain in the 1980s under Margaret Thatcher and this was often distorted analysis of contemporary events. An article by Tom Henri and John Hutnyk for the same special issue is also available for download via advanced access. For a long time I have been searching for an online version of this article from October 1979 by Martin Jacques, editor of Marxism Today and CPGB Executive Committee member. The Marxism Today archive, for some reason, does not have the Oct 79 issue available online. But I think that this article by Jacques, written in the months after Thatcher’s electoral breakthrough, is a very concise piece that demonstrates the ‘new’ thinking by Jacques, Hall and other ‘Euros’ on the challenge that Thatcherism presented, and I believe that it is very good companion piece to Hall’s ‘The Great Moving Right Show’, which featured in the same magazine the previous January. I have now found the article here as part of the UNZ online archive of magazines and journals (most of the rest of the stuff in the collection are from the US). On the other hand, one can get carried away with the idea of Thatcherism (especially the ‘law and order’ part of it) as something new and novel in 1979. 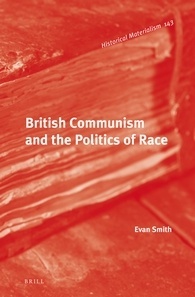 The politics of confrontation, as seen with the 1981 riots and the Miners’ Strike of 1984-85, was not just something adopted by the Conservatives upon Thatcher’s assumption of the leadership position and as several scholars have noted, the basis for the shift to the right attributed to Thatcherism had actually existed since the late 1960s. The view that Britain was on the verge of collapse had existed since the industrial militancy and cultural radicalism of the late 1960s and had been exacerbated by the economic crisis of the mid-1970s. Thatcherism was a response to this anxiety about the collapse of British society and was now openly willing to challenge the elements that were seen as ‘threats’ to Britain’s economic recovery and the ‘British way of life’. It should also be noted that Thatcher could not have implemented any of these confrontational actions without sharing a considerable amount of consensus with the British population. The seminal 1978 work by Stuart Hall, Tony Jefferson and others, Policing the Crisis, demonstrated how the issues of crime and policing were utilised by the right to present strict criminal justice measures as the effective antidote to the crises of the 1970s. As the economic crisis of the 1970s continued, the police were increasingly used to deal with ‘subversive’ elements of British society, dissatisfied with Labour’s ineffective policies. The perceived lack of initiative of the Labour Government on the economic crisis and the issues of law and order allowed the Conservatives to sway traditional Labour voters with the populist notions of a ‘strong state’ to deal with the trade unions, crime, illegal immigrants and other ‘subversive’ elements. This populist appeal was part of the reason why around a third of trade unionists voted for the Conservatives in the May 1979 General Election, as Hobsbawm stated here (p. 265). However these populist notions and the result of a more restrictive police presence were not merely creations of Thatcher herself. Paul Gilroy and Joe Sim wrote in 1985 (here) that ‘as far as law and order, policing and criminal justice matters are concerned, the Thatcher governments do not represent a decisive break with patterns in preceding years’, with the elements for a confrontational and politicised police force being present in the ‘fudged social democracy of the Wilson, Heath and Callaghan years’ (p. 18). But under Thatcher, I think you can see a difference, as the police and other repressive institutions of the criminal justice system were explicitly used against certain demonised parts of society and there was increasing consent for this use amongst large sections of the British public. It is not until the late 1980s, particularly in the aftermath of the Hillsborough disaster and the police reaction to the anti-Poll Tax movement, that the Thatcherite supporter base become dissatisfied with the excesses of Thatcher’s law and order agenda – before this, those who were on the receiving end of it were often elements that the Tories had calculatedly excised from ‘British society’, but by the end of her reign, the consent of her traditional supporter base had also evaporated. He understood Thatcherism as not just a type of politics or statecraft, but a popular cultural phenomenon, a moral idiom, a common sense touching on the lived experience of polyglot social layers – somehow, Thatcherism was not just a doctrine of reaction but a hegemonic project, which managed to bind the abstruse dogma of neoliberalism to concrete, deeply felt experience. And the ground work for this cultural advance had, as he and numerous co-authors at the Centre for Cultural Studies had shown in Policing the Crisis, been conducted since the late 1960s by a ‘New Right’ personated first in Powell then in Thatcher. It had worked through a series of racial moral panics about crime, to connotatively link the experience of unemployment and depression to a wider narrative of British decline, the breakdown of law and order, the loss of imperial omnipotence, and so on. The role of nationalism, and ‘Britishness’ in particular, was central to the Right’s appeal. 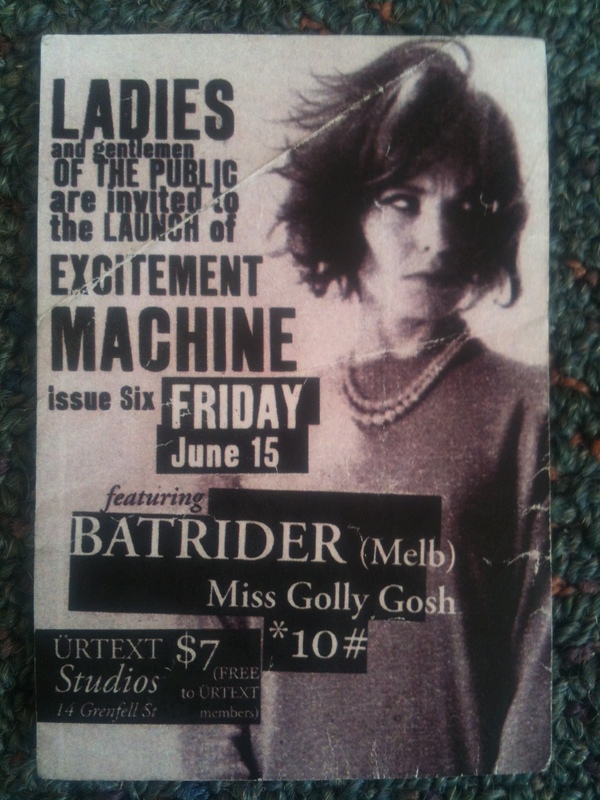 When I first started this blog last year, I talked in this post about my collection of flyers for gigs around Adelaide that I had collected over the last decade. As I have a bit more proficient with blogging, I thought I’d post some of my collection in stages here. I hope you enjoy this trip down memory lane! 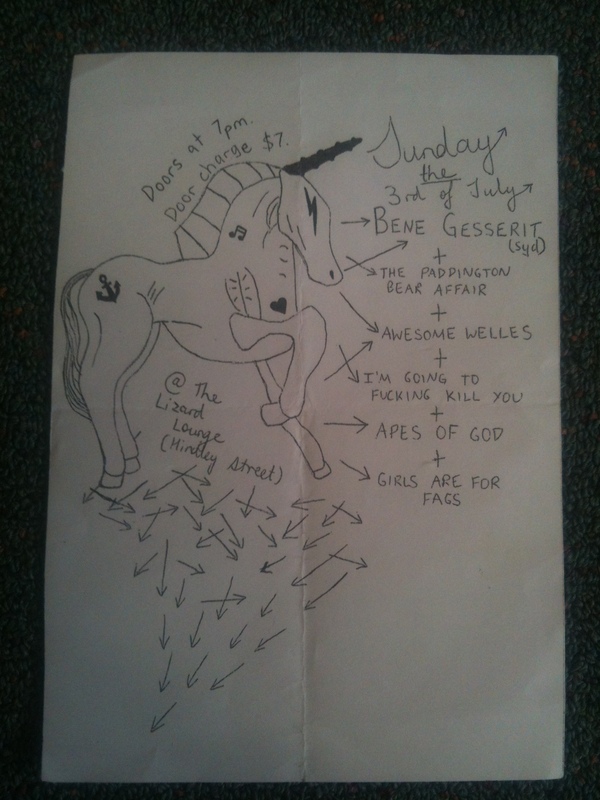 I played at this gig in Awesome Wells (sic – spelt wrongly by Tom who put the show on). Avalon/SEAS gallery was a great venue, but it was not a licensed venue and thus putting on shows there were difficult to organise. Another show at Avalon/SEAS. This gig was famous for two things. Firstly, the vocalist for Pretty Girls Make Graves was sick, so people from the audience were recruited to sing with the band. Secondly, the vocalist from Les Savy Fav was mental – I remember him running up the stairs out of the venue as far as the mic lead could let him. 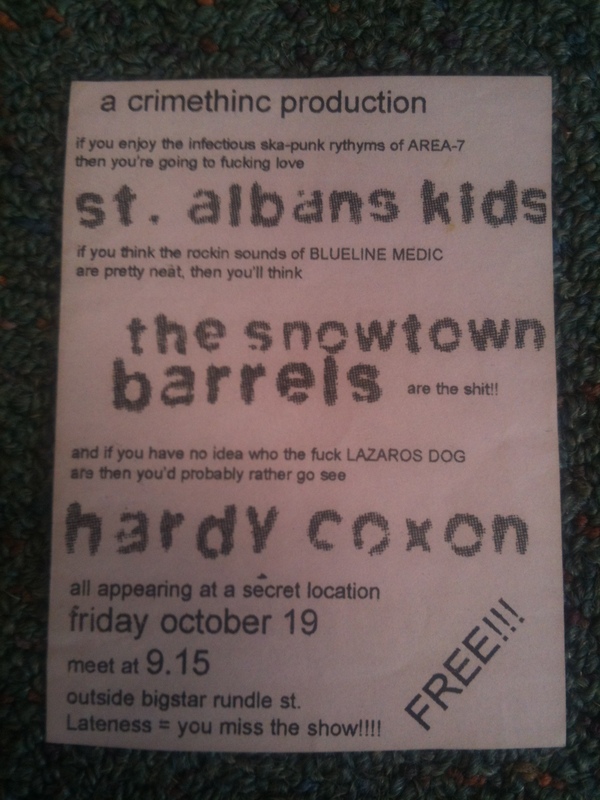 A secret show put on by St. Albans Kids. The gig actually took place in the car park behind The Austral. St. Albans Kids also put on guerilla shows in Rundle Mall (at the corner of Gawler Place), out front of the Dom Polski Centre and on top of the car park opposite the Elephant & Wheelbarrow. I remember Hardy Coxon being excellent that night. 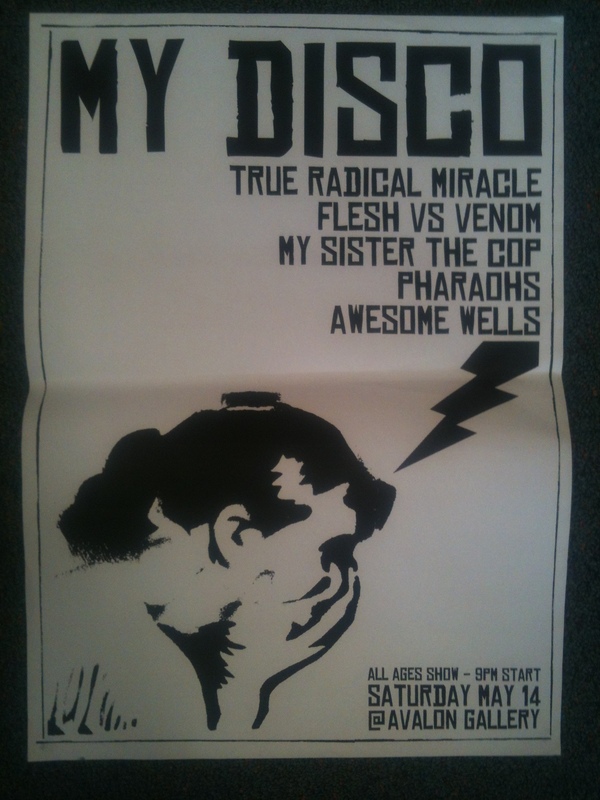 The first show I played in Awesome Welles. Apes of God (Damn) were particularly awesome. 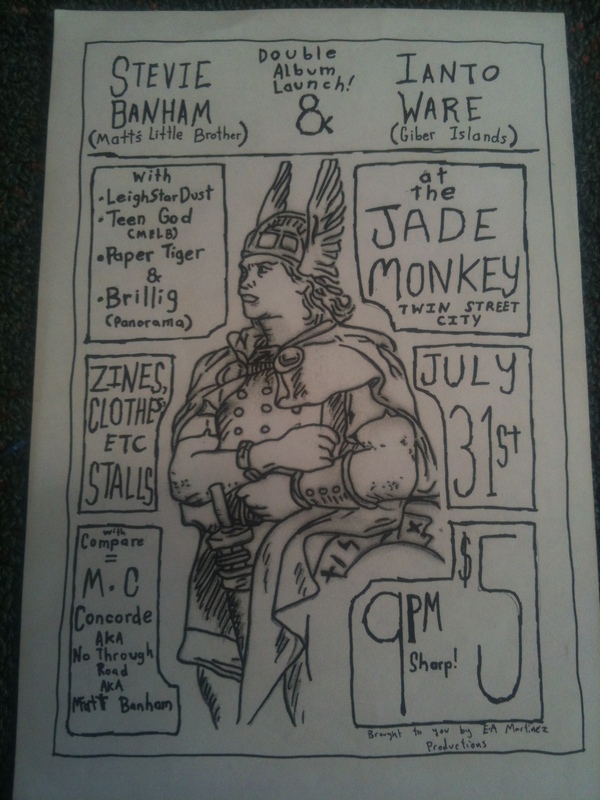 Before Format and the Adelaide Zine Fair, Dr Ianto Ware was plugging zines at shows like this. I reckon this was shortly after the Jade Monkey opened (which is now shut down). 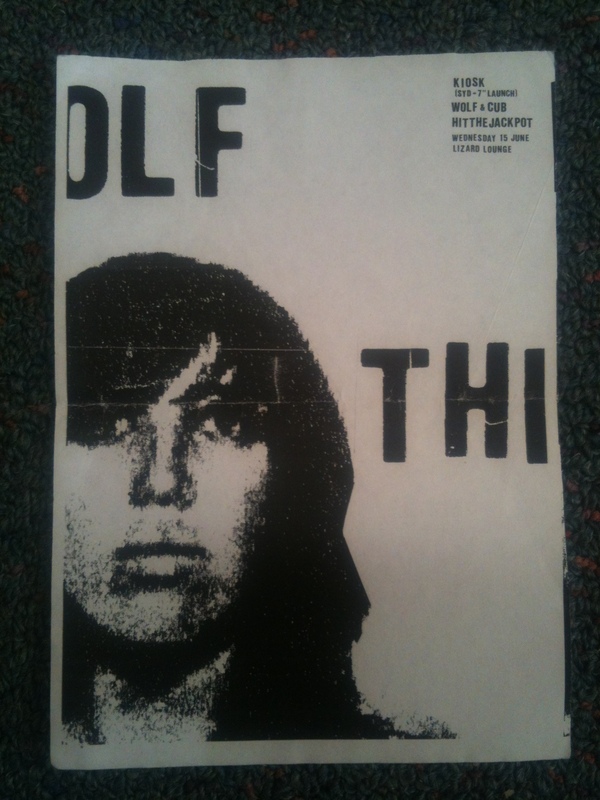 This is the oldest flyer I have in my collection. Allure used to be a cocktail bar above Supermild on Hindley Street. I think Roo Shooter also played this gig. Urtext was a weird venue (it was actually a disused office space), but they did put on some great shows. Batrider were originally from New Zealand, but became a default Adelaide band over time. 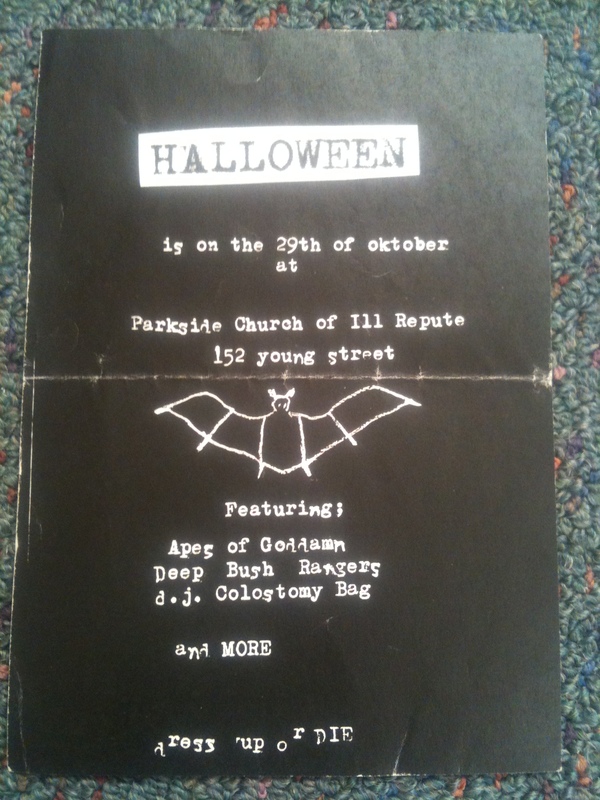 Halloweens were always spent at “the Church” in Parkside (not the nightclub). A very cool party room and some of the best costumes I’ve ever seen. 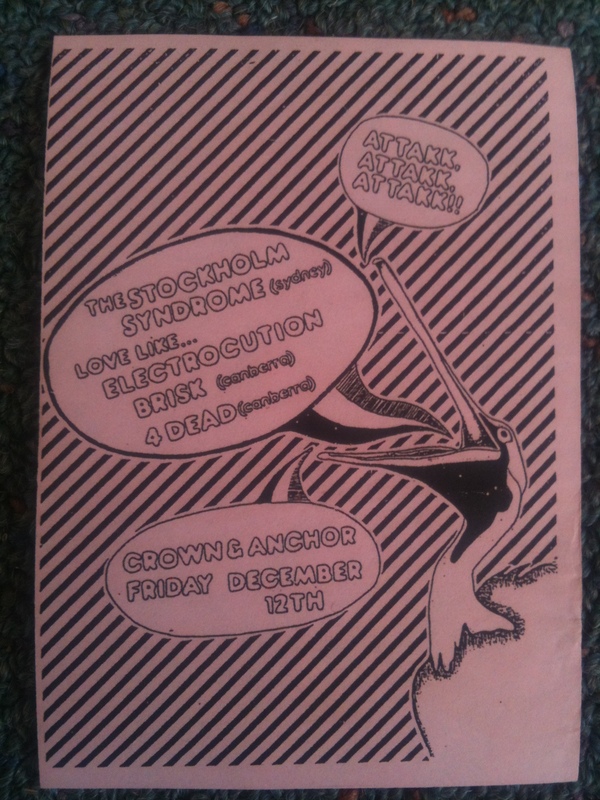 You can’t have a collection of gig flyers without one from a gig at the Cranker. Nuff said, really. 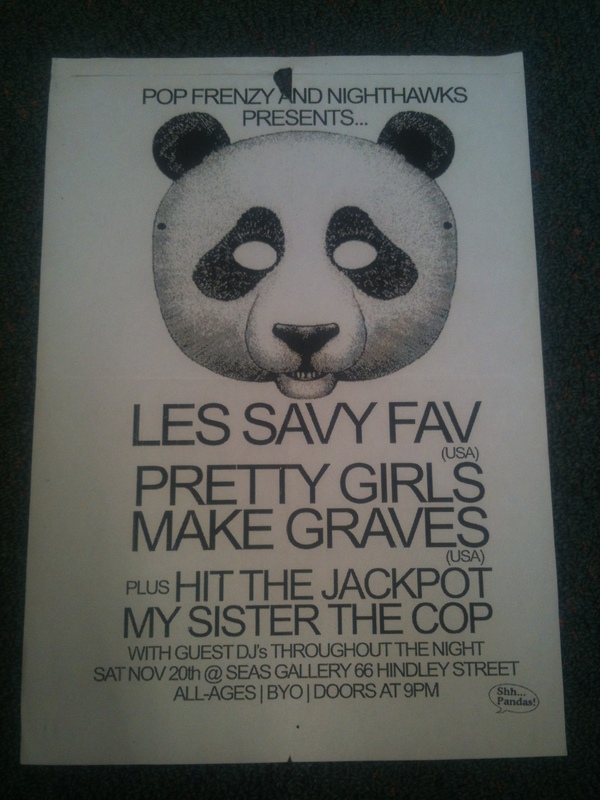 This was a gig with the original Wolf & Cub line-up and I think one of the first gigs put on at the Lizard Lounge when it was in the old Pizza Hut on Hindley St. Kiosk were amazing. So there you go. I will post more in the future. 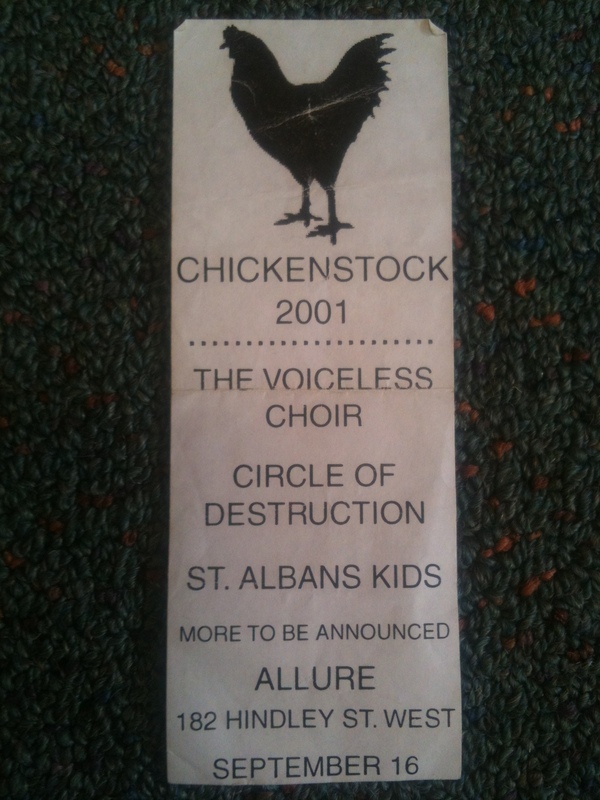 If you have any recollections of these gigs, or flyers that you’ve tucked away, let me know! I am not weighing in on the current crisis in the SWP (although recently writing the introduction to our edited volume on the history of the British far left has made me think that revisiting the International Socialists’ ‘turn to the class’ in 1969 and the subsequent factional fighting in the IS in the early-to-mid 1970s might be fruitful for understanding the contemporary discussions over the democratic centralist structure of the SWP), but as part of the debate over at Socialist Unity, former Communist Party ‘Euro’ Mark Perryman (who now runs Philosophy Football) has written about his experiences in the CPGB and the left since its dissolution in 1991. His latest piece can be found here, which includes a link to a free downloadable version of his chapter in the Lawrence & Wishart book, After the Party (edited by Andy Croft). It is fascinating account of how the Eurocommunist/Gramscian approach (popularly associated with the journal Marxism Today) still attracted young activists and showed some possibilities of where left could have headed, as the usual historiography paints a picture of the CPGB in terminal decline by the early 1980s. So read up, and follow the debates! As migration scholars such as Stephen Castles have long highlighted, governments often do this through deliberately incoherent immigration policies: they talk tough to appease anti-immigration groups, but follow up with impracticable controls so that continuing immigration pleases immigration advocates. Blaming others for quashing grand nationalist plans makes failure looks heroic. This is similar to what I’ve argued here and here. But I think Gamlen misses out something here. While he correctly asserts that immigration control policies are incoherent and being tough is in many ways ‘impracticable’ because migration is continually required (and allowed in many ways) by the UK, immigration control is also not ‘weak’ – there are circumstances where immigration controls are indeed restrictive and impact negatively upon certain groups of migrants. The experience of asylum seekers and migrants from the developing world show that immigration control can be ‘tough’ and that these groups, often deemed ‘undesirable’ by the authorities, are more likely to bear brunt of immigration control, even though there might be little change in overall net migration figures. However in the process of this maintaining this myth of sovereignty, immigration control, while not effective in keeping all migrants out, has pushed its ‘desire for order’ upon certain migrant groups who have been considered ‘undesirable’. As Virginie Guiraudon and Gallya Lahav have argued, states have ‘devised a number of ways to circumvent normative constraints’[ii] and the state uses the transitional ‘space’ of the border control system to exert power – stretching the rules and guidelines of appropriate behaviour, applying pressure and scrutiny to those migrants who are the most ‘marginal’, tinkering with the laws to limit who is considered ‘desirable’. 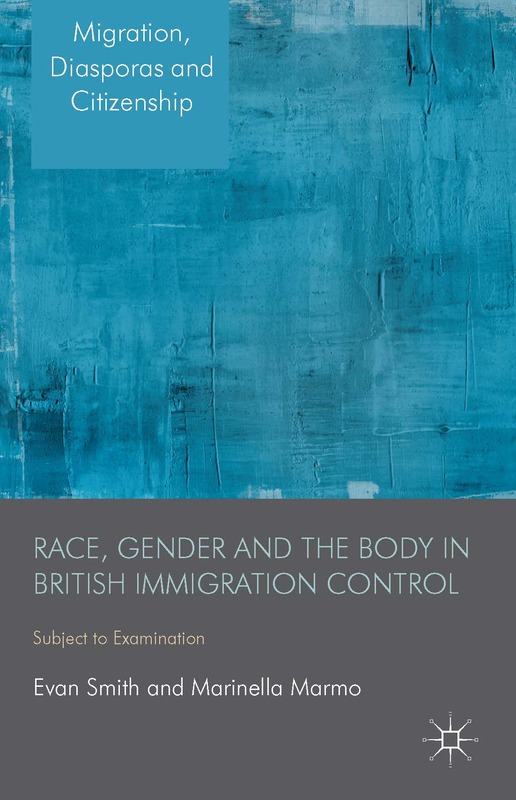 By using controls to determine the migrant’s subordinate status, the controversies of the 1970s demonstrate that there are very real victims of this ambivalent system. [i] David Renton, ‘Labour Migration: A Historical Perspective’, (accessed 11 March, 2009). [ii] Virginie Guiraudon & Gallya Lahav, ‘A Reappraisal of the State Sovereignty Debate: The Case of Migration Control’, Comparative Political Studies, 33/2 (March 2000) 164. To try and coordinate my social media ‘profile’, my new twitter handle is @hatfulofhistory. If you are following me, I think there’s no real change, but remember to tweet me using this handle now. Following on from this post, I thought some people might be interested in Lawrence Parker’s talk at the launch of his book into anti-revisionist (or left) opposition in the Communist Party of Great Britain, The Kick Inside. The CPGB’s Weekly Worker has reproduced the talk here. 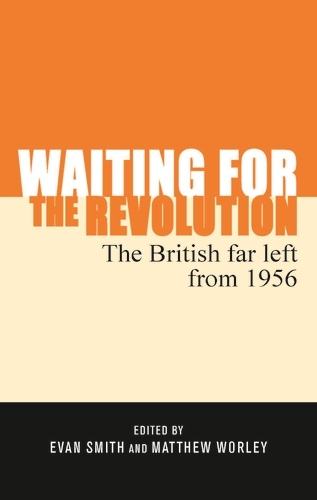 Parker rightly argues that the splits that developed in the CPGB in the 1970s and 1980s went beyond the ‘tankies’ and the ‘Euros’ (what I tend to refer to as the ‘traditionalist’ wing and the ‘reformer’ wing) and identifies at least five different groups within the Party at the time. On a related note, the history of the far left collection being edited by Matt Worley and myself is coming along nicely. 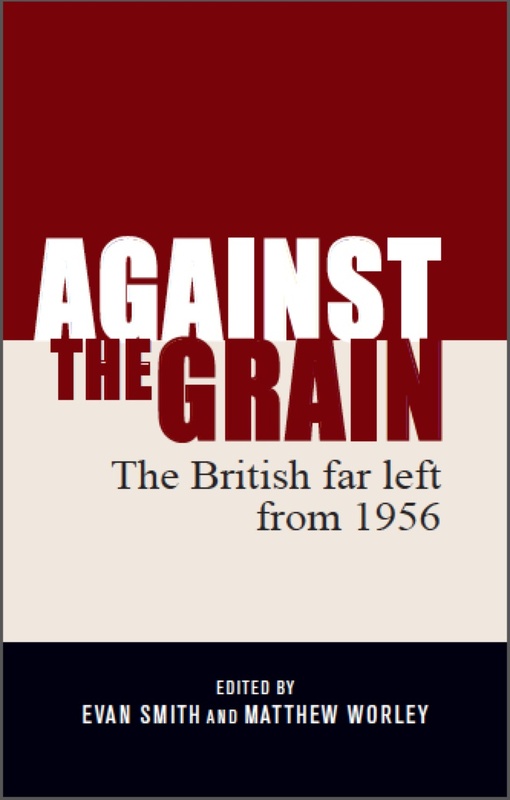 The chapters are being finalised (including one on opposition within the CPGB) and it is looking to be a great collection. I am currently writing the introduction and should have it done before I head off to the UK in February. We are hoping that the final product should be available by early 2014 from Manchester University Press.